As a traditional psychotherapist, Dr. Brian Weiss was skeptical when one of his patients began recalling past-life traumas. Yet these memories allowed her to recover from her recurring nightmares and anxiety attacks in a way he'd never experienced. His skepticism eroded further when she began to channel messages from "the space between lives" and reveal truths about his dead son that she never could have known. Now a leader in the field of past-life therapy, Dr. Weiss has helped thousands connect with their past lives and experience tremendous healing. 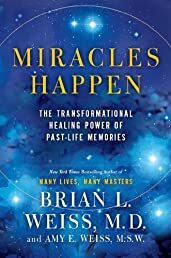 In Miracles Happen, Weiss, along with his daughter, Amy, shares these remarkable real-life stories to reveal how past-life regression holds the keys to our spiritual purpose. The awareness that we have multiple lifetimes, separated by spiritual interludes on the other side, helps to dissolve the fear of death and bring more peace and joy into the present moment. And in Miracles Happen, personal stories, accompanied by Dr. Weiss's inspiring teachings, reveal how getting in touch with our past lives can profoundly and permanently heal mind and body. In the end, we come away inspired, renewed, and assured of the truth that we are eternal beings who are free to heal our current wounds by better understanding our past. It's a practice that helps us improve our current lives, evolve along our spiritual paths, and live each day with purpose.